I lost the appetite for attending events. I got tired or I'm just getting old, hehehe! 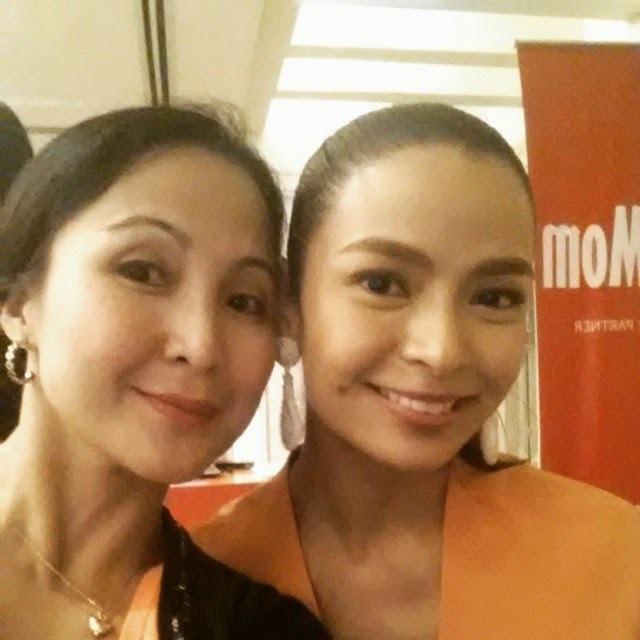 But I could not say no to the Queen of Mommy Mundo - Janice Crisostomo, so I found myself at Edades Tower, Rockwell, Makati City, yesterday. 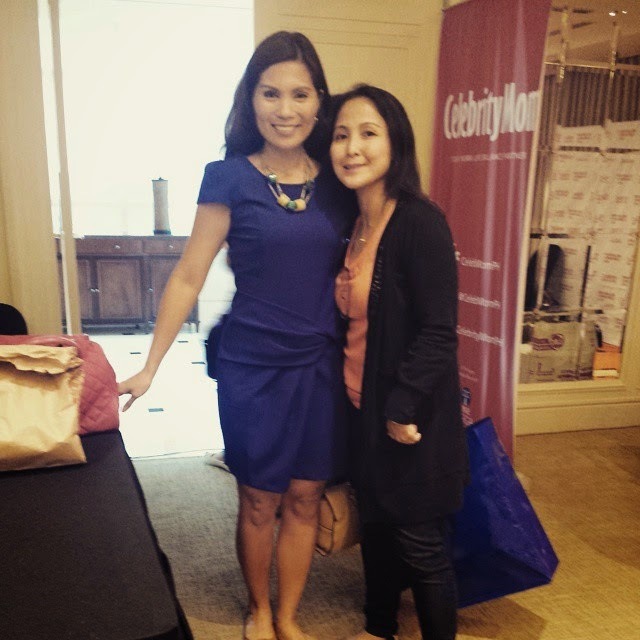 Even Danica Sotto-Pingris attented the event to learn from the experts. I came an hour late because I attended my daughter's field demo at school. 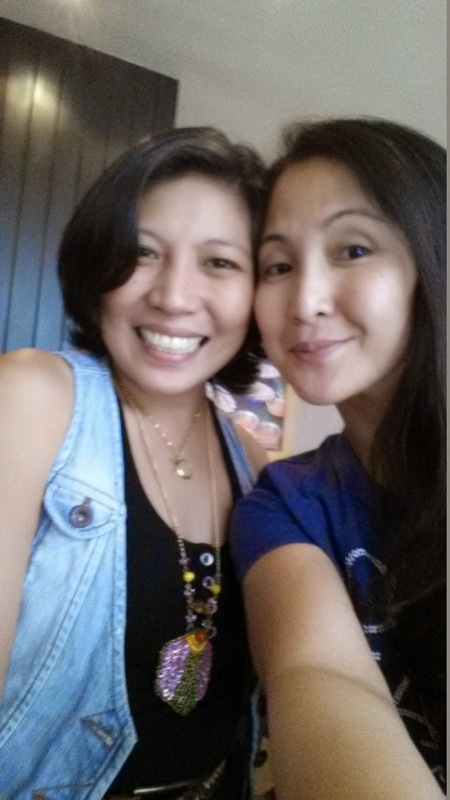 When I arrived Hindy Weber Tantoco, founder of Holy Carabao Farms and the Fun Farm, talk was almost done. Sayang! 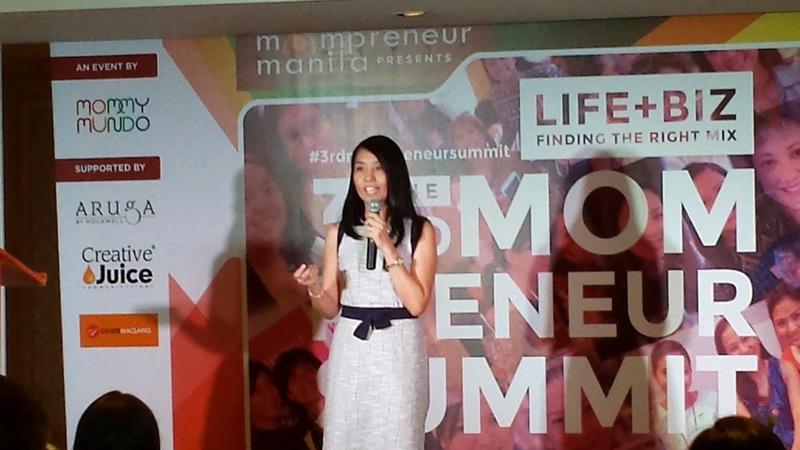 Mutya Laxa Buensuceso, Founder of Spinkie and Country Manager of Luxasia Philippines. 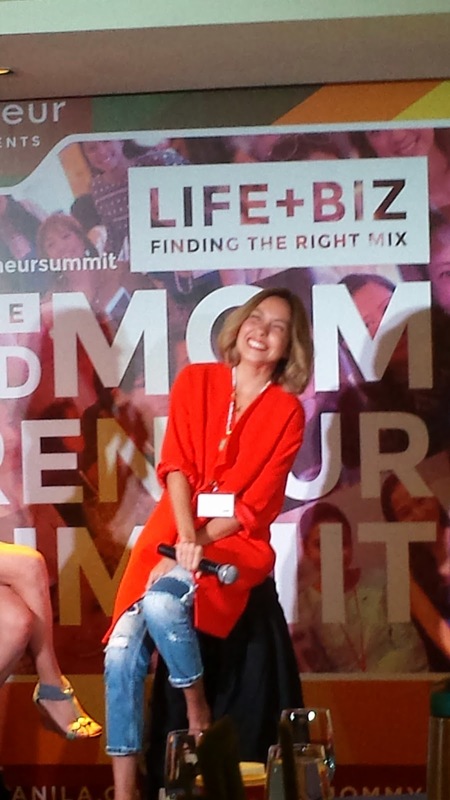 Through this event I was inspired and motivated by the stories told by the speakers. On the way down, I met young moms Lan and Donna of Mother Nurture. They have inspired me to be active again in breastfeeding campaign. John and I targets to travel every weekend this 2015 but with a limited time and budget this week, we've decided to go to Bunga Falls, also known as Twin and Nagcarlan Falls, located at Bgy. Bunga, Nagcarlan, Laguna. Our travel buddies for this trip, the Borjes. Entrance fee is only P5.00. I suggest you visit the place early like we did. We arrived around 6am before many tourist arrived and left at 930am then headed at Yambo Lake. Do take note of the following: They do not have restroom where you can rinse after swimming. We had to use the distilled water to rinse the kids. 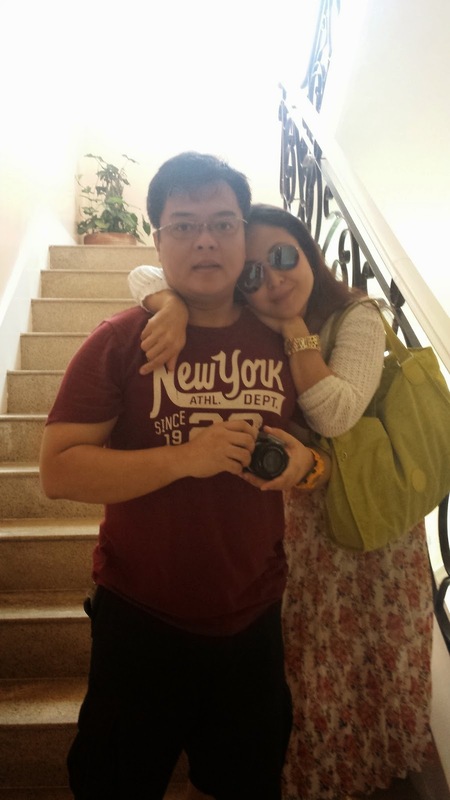 Since Lyn packed for our lunch, we only spent around P2,000 for our whole trip in Nagcarlan. Pwede na diba, makita lang ang ganda ng Pilipinas? Certainly there are things that we can't let go. For some, the addiction to bags and shoes. Others, cigarettes and other vices. As for me, necklaces! 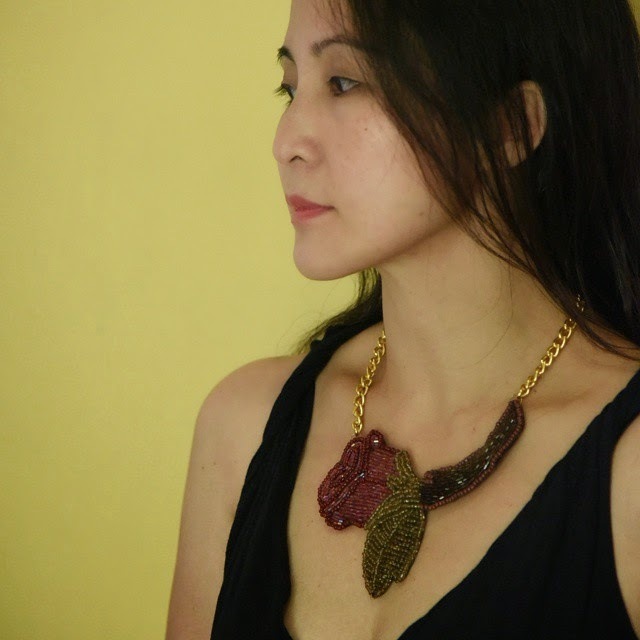 I can go out without rings, earrings, watch and bracelets but not without accessories for the neck. I'm so happy, I've reconnected with one of the most creative, passionate and selfless young woman I know - PJ Valenciano! Check out PJ's Palamuti Shop where you'll find creative pieces made by women who not only make wonderful accessories to earn but also to help and inspire others. 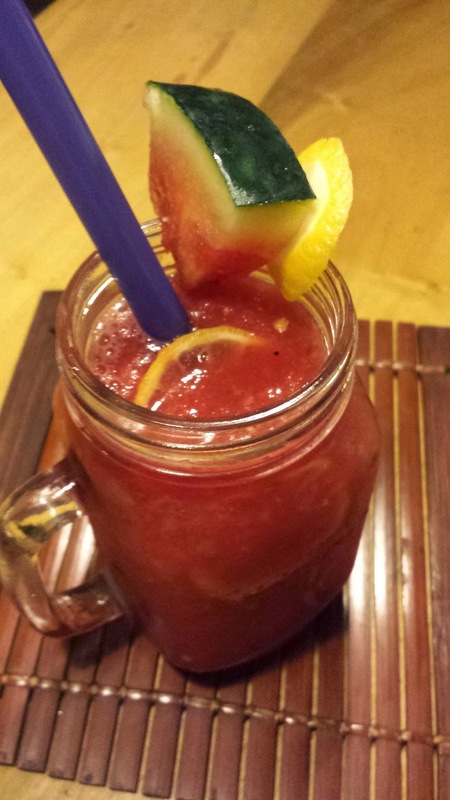 Though it's not yet summer, having a jar of watermelon shake makes my day better! 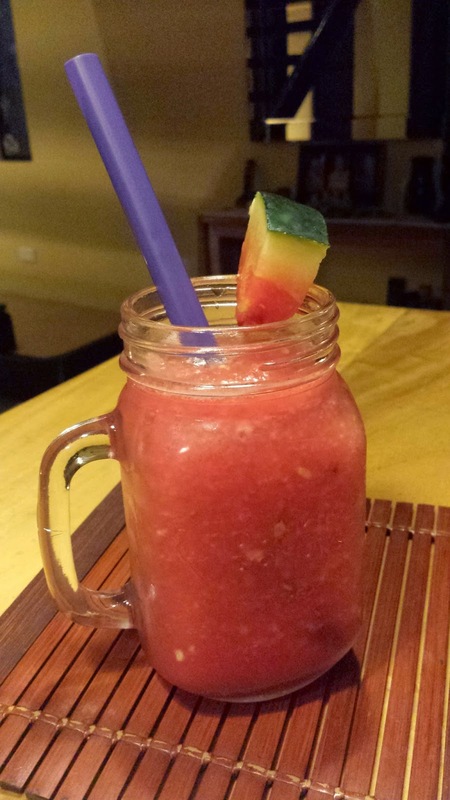 I love having this fruit drink, specially at night because it curves my hunger for rice and coffee. 1. Packed with a lot of antioxidants. 2. High in Vitamin C and is a good source of Vitamin A and beta-carotene. 3. Great source of lycopene, which is said to help reduce the risks of prostate cancer and other heart diseases. 4. Rich in electrolytes and potassium which makes it an ideal drink after a heavy workout. These are not all of the watermelon health benefits. 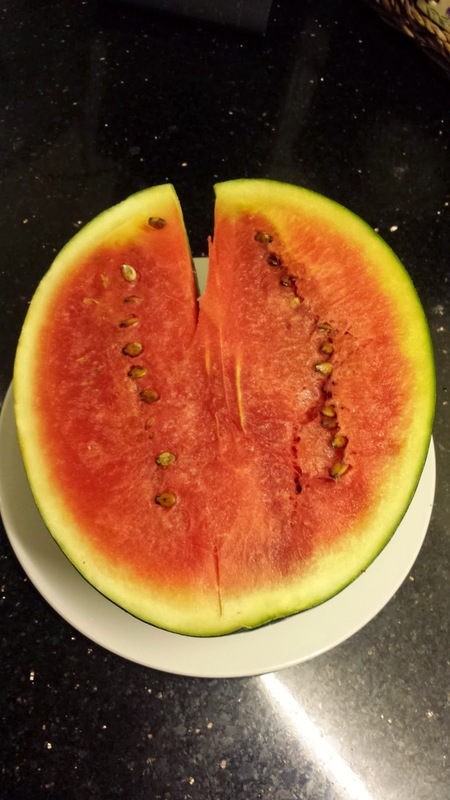 There are a lot more watermelon nutrition facts out there that truly makes them one of the best fruits out there. 3. The seeds have a nutty flavour and can be eaten, dried and roasted, or ground into flour. 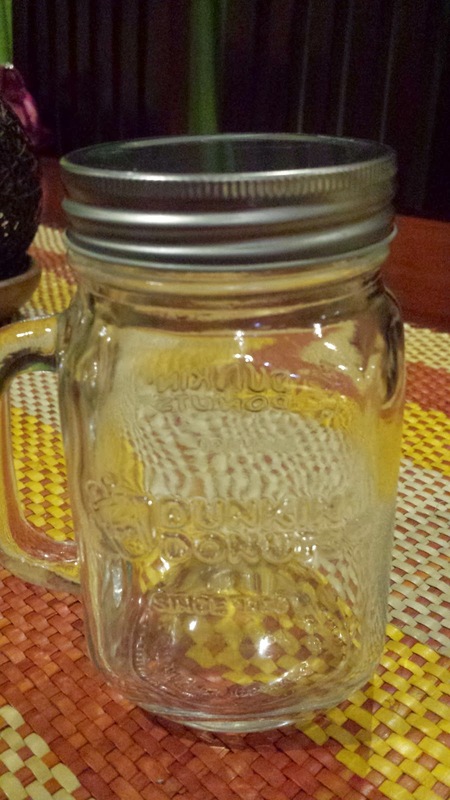 Last December, John brought home donuts from Dunkin' Donuts and happily said he bought a mason jar since he knows I like jars so much. I told him, yes, I like jars but I don't want something that promotes a certain company. Well, sometimes when you least expect from something or someone, a great surprise will come along. 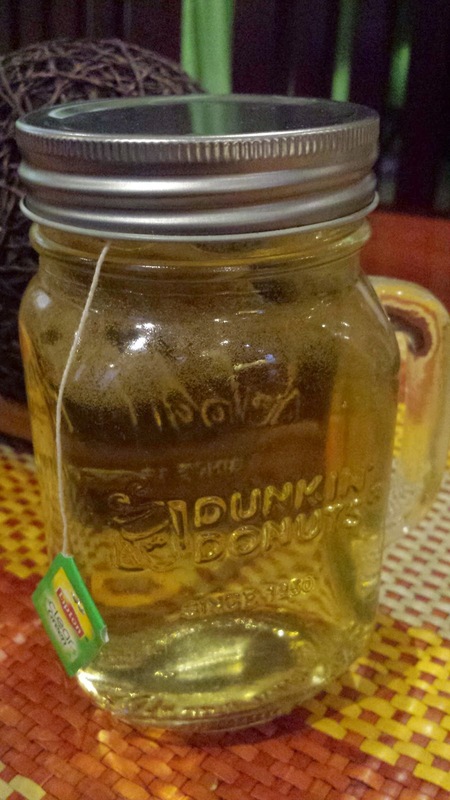 I don't like green tea, and certainly don't like this Dunkin' Donuts mason jar. Of late though, these two are my everyday companion for a healthier me. 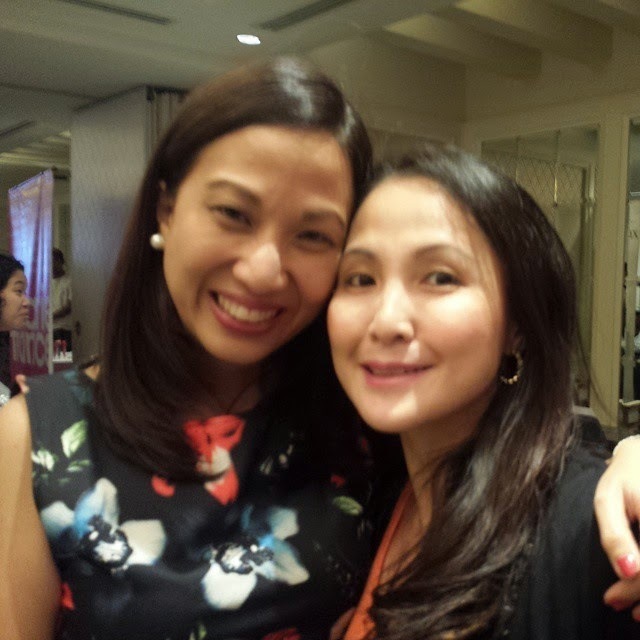 When my twin kids were studying at Angel's in preschool in 2006, I met this lovely, slim and young looking mom of one of Julia and Rafael's classmates. Well, I was wrong to think that she's a mom. She's actually a 60-year old grandma already. I asked her how she maintains her figure, she just said, wala naman, I just like drinking green tea instead of coffee. For the last 8 years, I wanted to do her practice but I couldn't because I LOVE COFFEE! I just could not let go of my comfort drink. 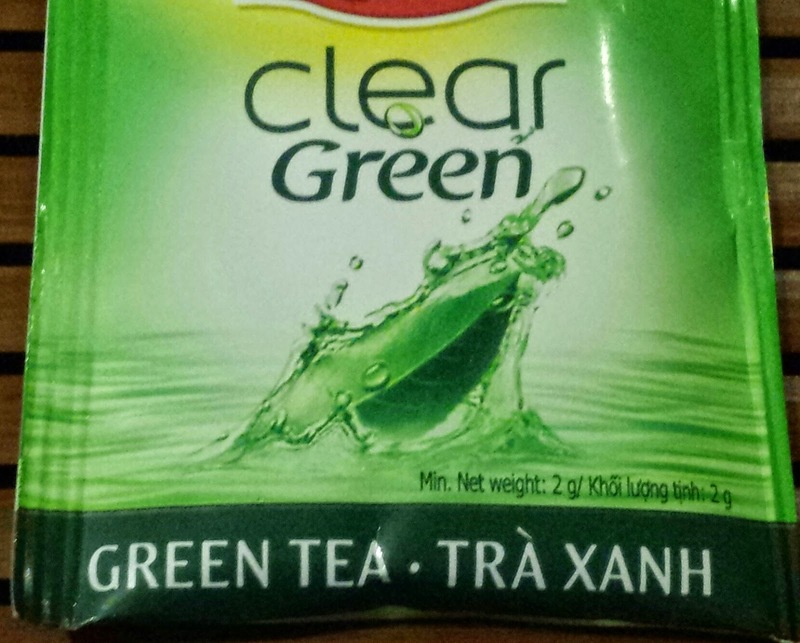 Starting this January, I shifted my morning drink from coffee to green tea. Aba, aba, aba, maganda pala! I don't easily get hungry unlike before when I drink coffee. Dati ang kape ay dapat may kasabay na pandesal at pansit. Ngayon, I drink hot green tea, exercise, then brunch around 930am. I'm telling you, I feel better and lighter...o sige na nga, I feel sexier! I still drink coffee though, but not as much as 5 cups a day like before. 1. Green Tea is loaded with polyphenols like flavonoids and catechins that acts as antioxidants that have powerful effects on the body such as improved brain function, fat loss, a lower risk of cancer. 2. Green Tea contains various bioactive compounds with large amounts of important nutrients. 3. Green Tea contains a powerful compounds called Epigallocatechin Gallate (EGCG), which has been studied to treat various diseases like cancer, and may be one of the main reasons green tea has such powerful medicinal properties. I first learned about Cavinti Falls in an Asian travel show a few years back. I told my husband about the place but he was probably too busy reading his graphic novel book that he can't remember about it. Last Monday, John saw photos of Cavinti Falls from Azrael's FB account and he said to contact someone who knows the place. Unfortunately, I wasn't able to talk to the point person introduced by Az. We've been to farther places without a plan so there's nothing to worry about as we headed early (very early!) at Cavinti Falls today to experience the thrill. We arrived around 6am at Pagsanjan. I asked directions on how to get to Cavinti Falls but people from Pagsanjan were telling me to go to any hotel in Pagsanjan to book a boat that will bring us at Cavinti Falls. So we did, and we were told that it'll cost us P1,300. I said, "for one boat for my family?". Ang sagot, "ay hindi po per head po". We got confused because they were telling us Pagsanjan Falls and Cavinti is one and the same. Mabuti na lang, we met lovely biker couple who were kind enough to clear the confusion. 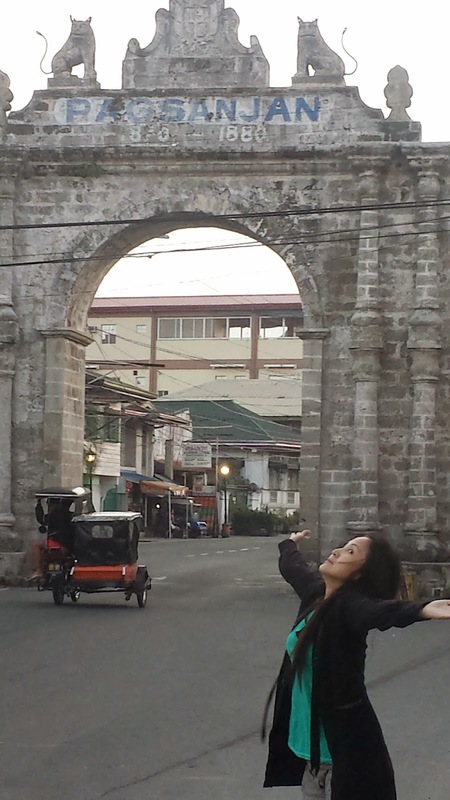 From there we went straight and followed GPS Karen going to Cavinti Church to ask for the right directions. 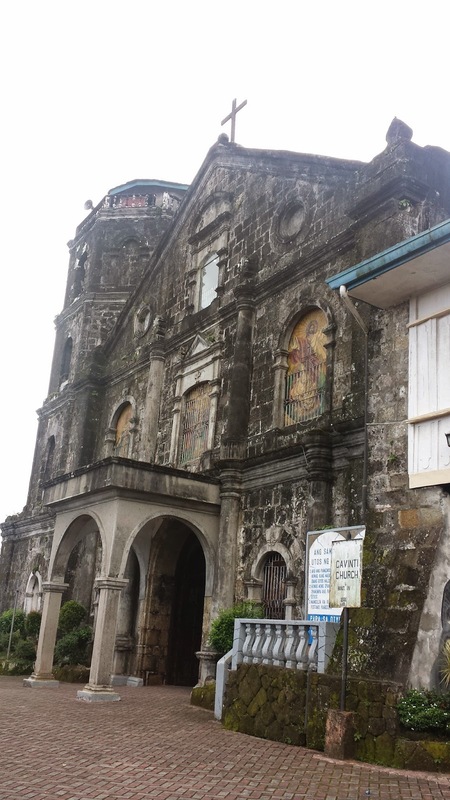 Cavinti Municipal is just across Cavinti Church, where we met Kuya Arnel. From Kuya Arnel, we learned that it's just P270 per head for the trek, rapel and the falls experience. We almost didn't make it because children below 13 are not allowed for this kind of adventure because the stairs are too steep. John and I explained that our children have been trekking as early 4 years old. They called their head, we signed waivers and voila, Cavinti Falls na kami! Cavinti Falls is more popularly known as Pagsanjan Falls. The famous falls has been a cause of battle between Pagsanjan and Cavinti Municipalities. But the falls is actually located in Cavinti in the Sierra Madre mountain range in the province of Laguna, hence it it now called Cavinti Falls. If you plan to experience Cavinti Falls/Pagsanjan Falls do not be confused (like we did). You have two options. If you want it easy, go to any hotels in Pagsanjan and hire a boat for P1,300. Your P1,300 is good for at least 3 hours. I hour boat ride going to the falls, an hour stay at the falls, and an hour boat ride going back to the hotel or resort. If you are adventurous like us, go straight to Pueblo El Salvador Nature's Park and Picnic Grove. Talk to Municipal staff. They will accommodate you well. Pay P270, sign waivers, and experience the fun at Cavinti Falls. The perfect way to celebrate Valentine's Day is at View Park Hotel. Get high on romance as you spend this very special hearts day with good food, massage at The Spa, a refreshing pool and lots of photos! My family had a wonderful time at View Park Hotel last year so I'm sure you'll enjoy the place as well. Wizard's Chef is a small take-out burger joint born out of the owner's addiction to Clash of Clans. She said she was addicted to the game for a long time. Realizing that she's wasting her time playing, she turned her energy in creating her new found love - making burgers! I know the owner, Aizhel. 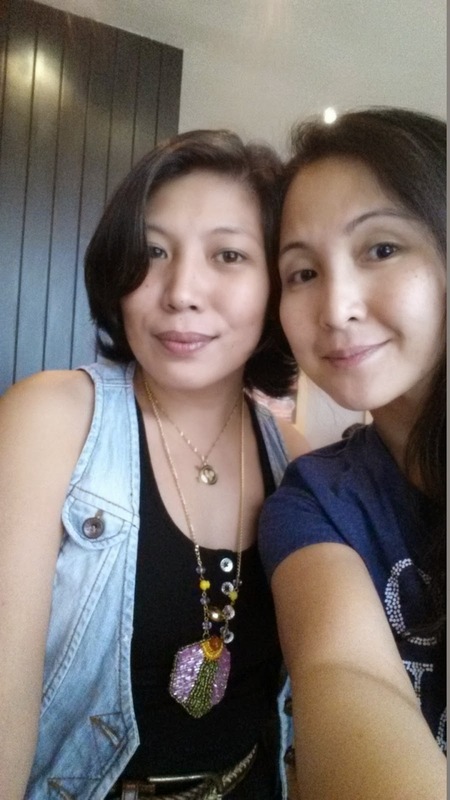 I met her 5 years ago at Super Bowl in Megamall. She's one-of-a-kind employee as she was always happy serving the clients. I've written about her in 2011, A Hero In Her Own Right. I knew wasn't an ordinary woman. And so when I got an invite to visit and try Wizard's Chef, I'm lost for words. Ang nasabi ko lang kay Aizhel, "ang galing mo, bilib ako sayo!". Aizhel prepares the patties herself and the marinade. Her iced tea is also good. She made it from all natural ingredients. Wizard's Chef opened last December 8, 2014, with a P20,000 borrowed capital from her friend in Canada. In less than a month, bawi na sya! WOW, KUMIKITANG HANAPBUHAY! Ang kagandahan pa ng Wizard's Chef, it's in Mandaluyong! They are open Mondays-Sundays from 5pm to 2am. 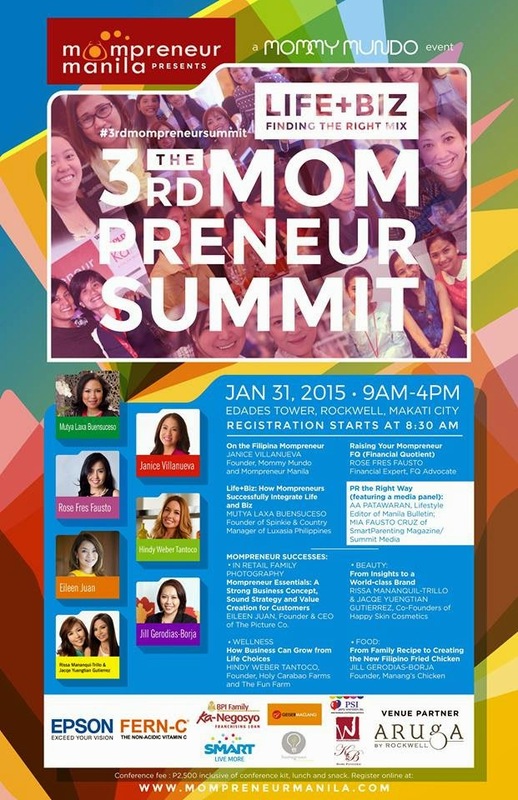 The 3rd MOMPRENEUR SUMMIT is happening on January 31, Saturday at Edades Tower, Rockwell, Makati City, from 9:00am to 4:00pm with the theme LIFE+BIZ. Our trip to Bicol was planned in less than an hour so I had no time to check out which restaurant is popular in that area. From CWC I FB messaged Lea Bongalonta, a former officemate in Bayantel, the places we must visit in Naga. Lea suggested churches, falls and Biggs Restaurant. While touring the province, we've seen more than 5 Biggs Diner but we didn't eat. On our way back to Manila, we got a wrong turn so the kids asked if we can eat first. Rafael suggested, "how about Biggs, mom?". I replied, "for as long as there's one along the way. If not, we'll eat somewhere". We had another wrong turn. Luckily there's one Biggs Diner where we actually had a wrong turn! We were meant to try the biggest food chain in Bicol after all. My family liked Biggs scrumptious dishes and American diner ambience. Plus the "kapuri-puring customer service from the manager. We ordered five breakfast meals, coffee is included in each meal. I asked if she can replace the three coffee for juice for the kids. Andaling kausap, no ifs and buts! Being inside Bigg's is not only a gastronomical treat but a feast for the eyes as well. Old stuff are hanged on the walls like typwriter, vintage toy cars, skateboards and many more. We love their paper place mats. We asked to take home a few pieces. Bigg's Diner is a 50's inspired diner, located right in the heart of Naga City. 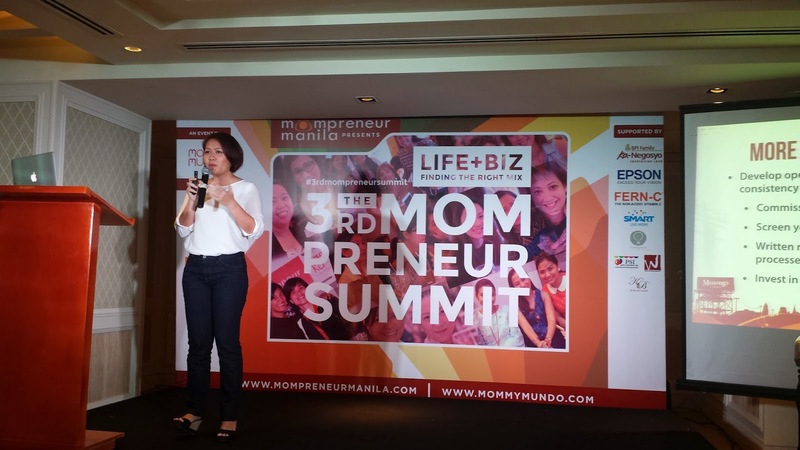 It was established in 1983 three friends who wanted to give running a food business a shot, namely Nene Bichara, Nienie Buenaflor, and Maricar Manjon. The manager told me that it was first named Mang Donald’sA on January 18, 1983. On September 13, 1990 they had to change the name Carl’s Diner when McDonal's filed legal rights. By October 21, 1994, Carl’s Diner became Bigg’s Diner as a reflection of the business growth. Bigg’s Diner at present is a major Bicolano success, being known as the best food chain in Bicol but also as a popular catering service.